It is good to try new skills. 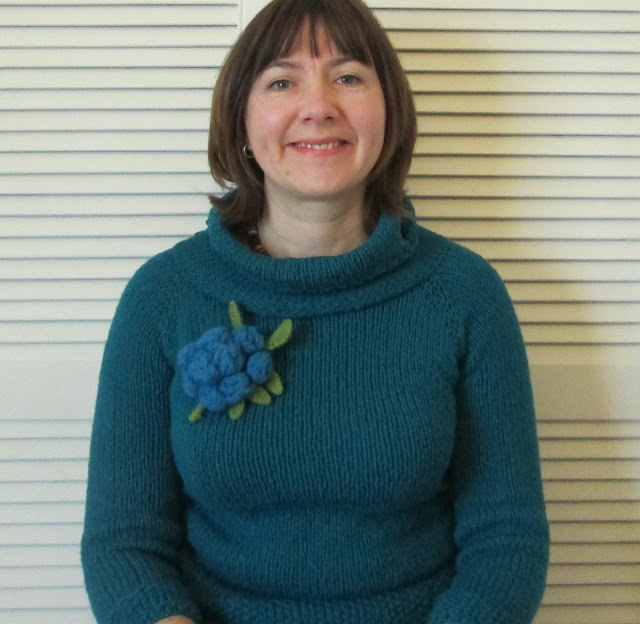 I have been having a go at pin tucks using a free download for the Betty Blouse pattern. My slippy viscose fabric choice did not make it easy for my first attempt at pin tucks. One is a bit bigger but I was pleased with the rest. 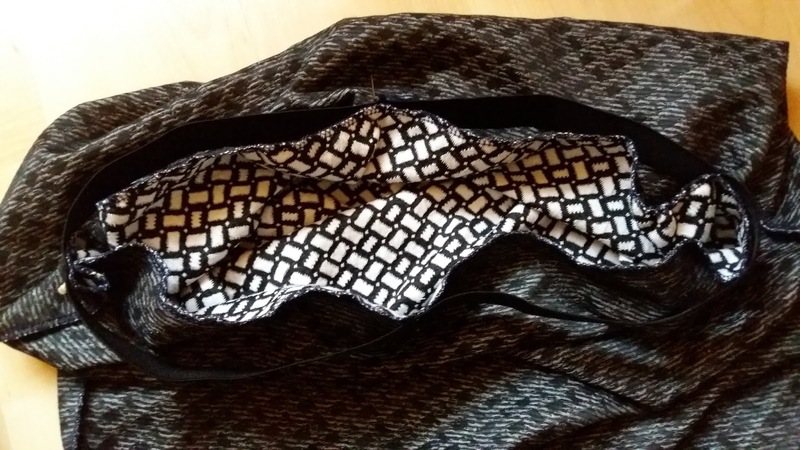 The reason I chose this fabric for this pattern was because the cotton version on the pattern picture stuck out too much at the shoulders for my liking therefore I was looking for a softer drape. It feels lovely when I wear it. 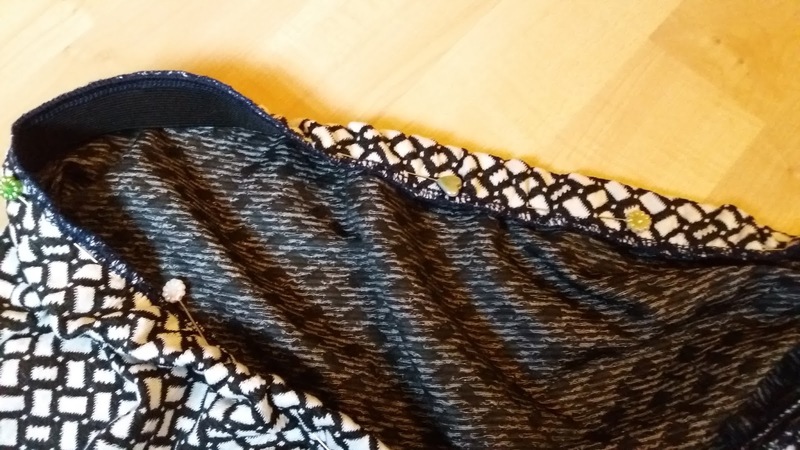 I did have to make some intermediate modifications for using this fabric rather than a light cotton. 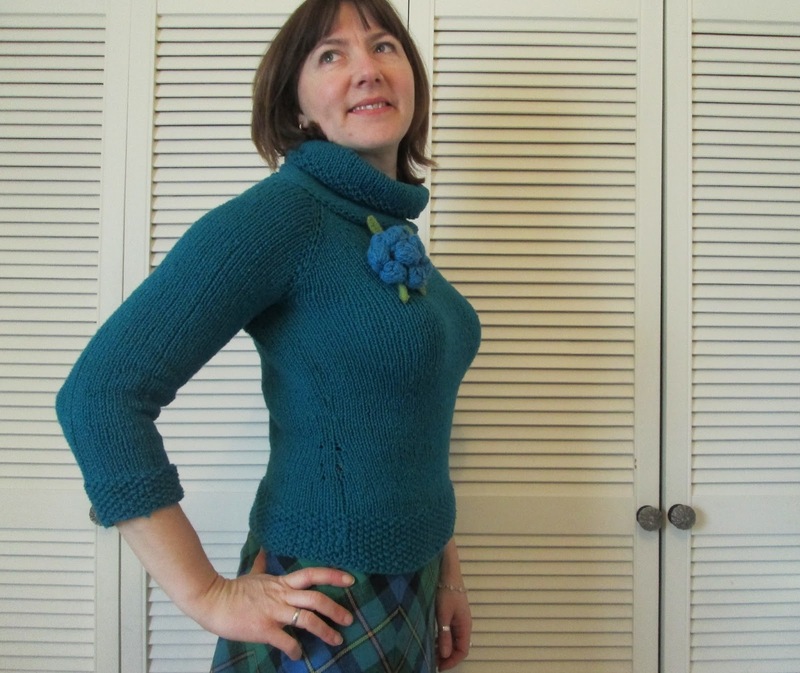 I added a neckband rather than using bias binding facings. The fabric was not strong enough against the bias binding - it hung down to reveal the binding. 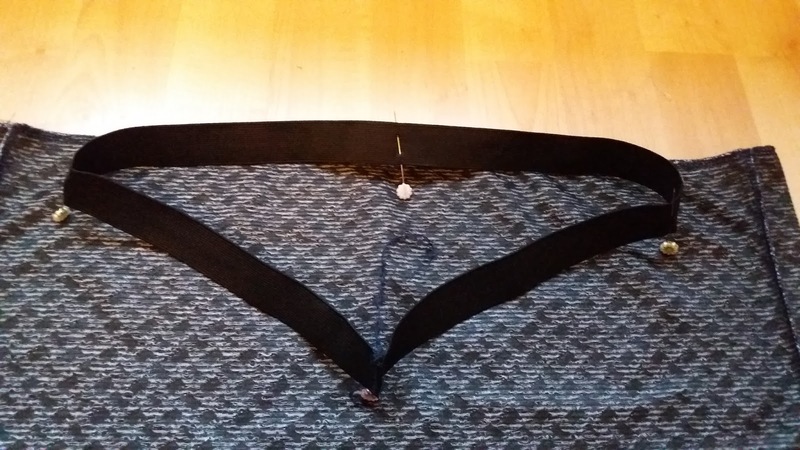 I did not bind the arms either, I just made a really small turned hem so that they would 'waterfall' I took a smidgen off the front neck edge too for a slicker shape. To finish the hem I used a narrow rolled hem to make it really fine. I did not use a special foot I just passed it through the machine twice. 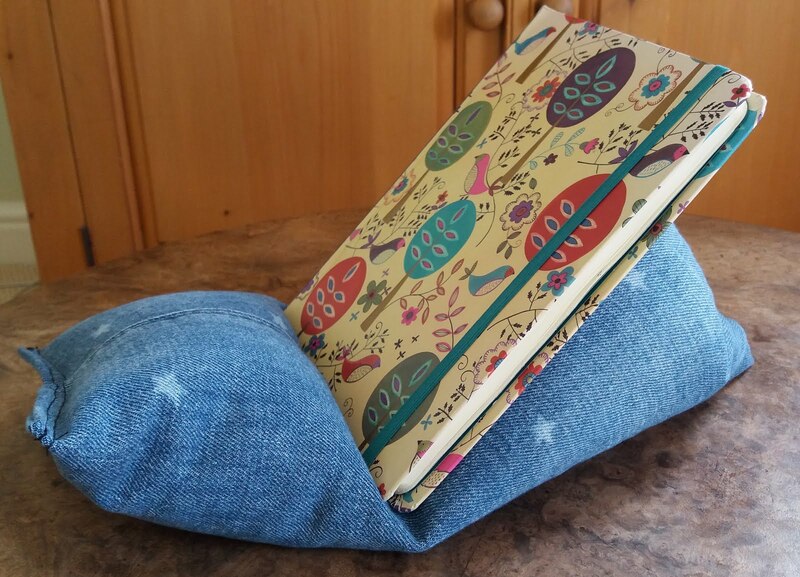 I used french seams for the sides because it was fraying quite quickly. 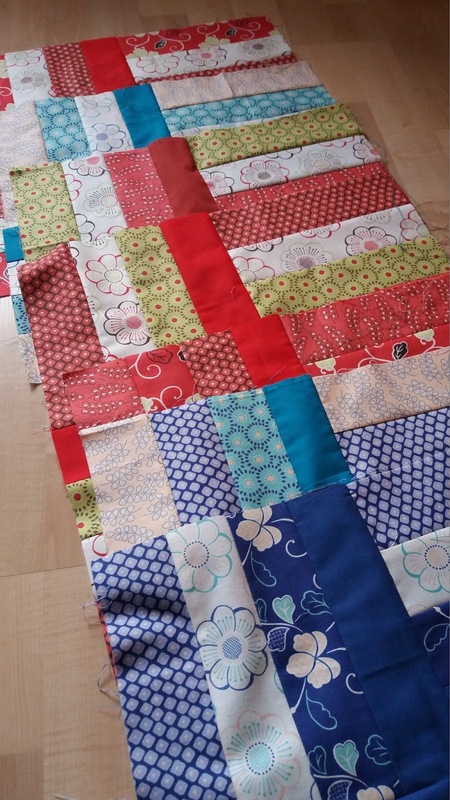 I cut a 12 so that I would have plenty to play with for the french seams. This fabric was given to me in an enormous stash haul at the beginning of the year. I did not buy it - promise. In fact I have been given more stuff in January than I could possibly believe from three different people who did not know my 2017 'no buy' pledge - fabric, wool and patterns. I really should stop saying yes. But when you can make a free top like this, why not? I often have a flurry of card making at the start of the year. I can sometimes make enormous batches which seem like more than I would ever use but they always seem to be gone by the end of the year. 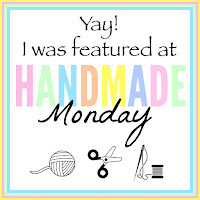 This month I decided to try out some paper crafting materials from Minerva my sponsor. I received a paper card pad by Tilda, some large white blank cards and a couple of good quality gel pens. I really enjoy making cards. They are an instant creative hit. I have made them for so long now I have absolutely no idea how much it costs to buy a card from the shop! The kind of paper crafting I like to do does not involve lots of bought products but a happy mix of recycled and found objects. This one is a combination of layered squares of paper and card with a doodle border. Simple but I like it. 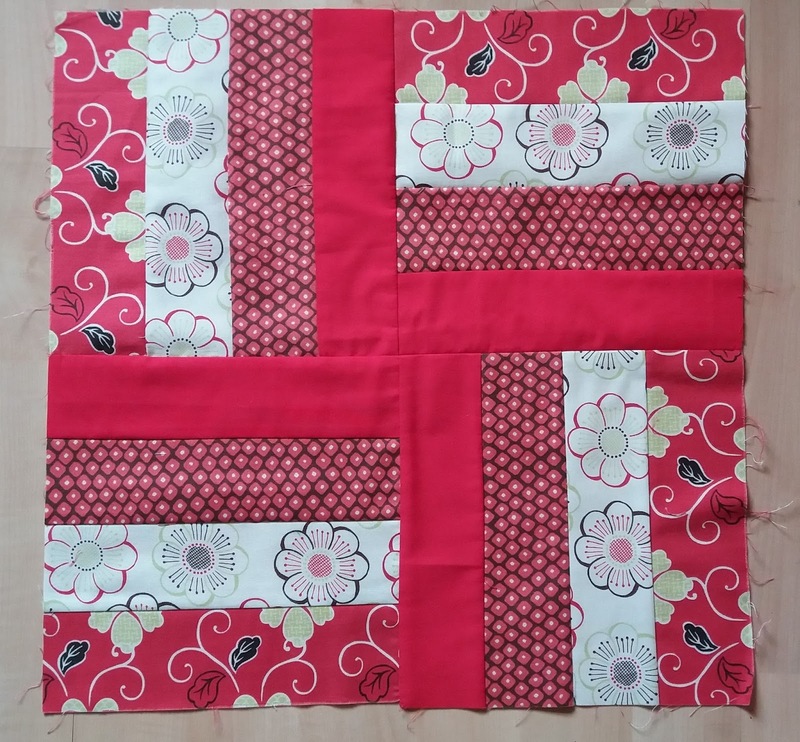 This patchwork design is useful to use up the little strips that get cut off the end of the main piece. I use this method a lot in many different guises. 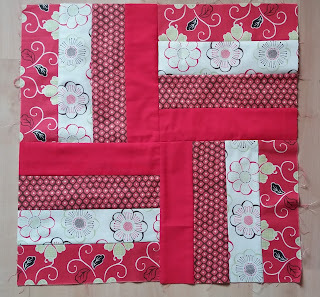 This one is finished with found buttons and another doodle border. I love this design too. I sometimes teach it at a craft class because people are amazed how easy it is to do for such a complicated effect. I also like that you only need paper, scissors and glue. You can find a tutorial for it here because it is not my design, it is by Melissa Samuels. I start to get super creative by the time I am ready to pack away. I try and use up all the bits off the table rather than throwing them all back into the drawer. 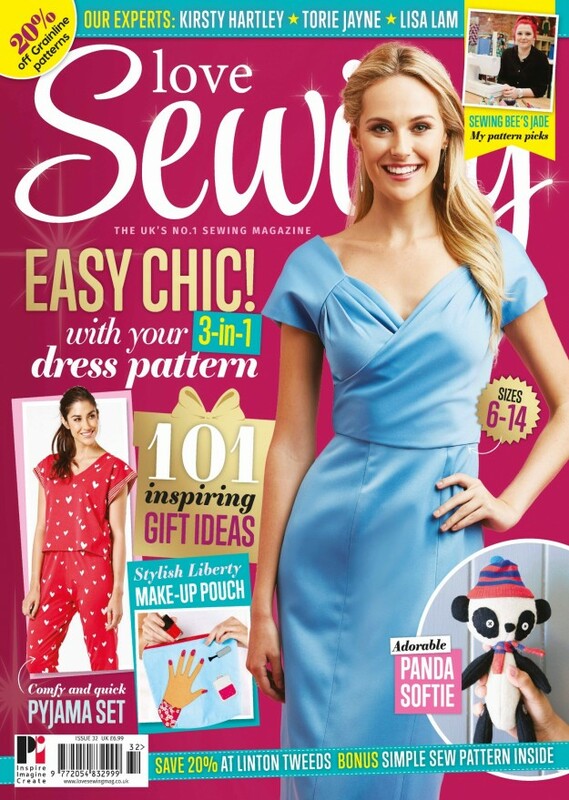 Can you spot the last little square of the ditsy floral print? Another stitchy themed card. Here they all are ready to be stored away in my card organiser. I have plenty more tilda card and ideas to make many more. I think sometimes people over think cards - you just needs scissors, card pens and glue really. My big girl is quite scatty. She often leaves her tiffin lunch box at school so then I give her my lunch bag and then she leaves that too until the lunch receptacle of shame for us all by the end of the week is a plastic bread bag! So I figured more is more and I improvised a couple of lunch bags. If you spill anything inside, simply throw them in the washing machine with your tea towels. A few more of those pesky fat quarters were used up here. I am still stash busting with gusto. I'm off to supervise the girls making their own sandwiches. I had an end-of-my-tether moment a few months back where I said I would not make sandwiches anymore if people were not going to eat them as it was so wasteful. They begged not to have school dinners and agreed to make their own, which of course requires a bit of observation. But I must say, since they have started to make them, they have eaten far more of their own lunch. Background context info:In UK state primary schools children can choose whether to have school dinners, which you pay for after the age of seven. (unless you are in receipt of welfare in which case you can apply for free school dinners for longer) The alternative is to take a packed lunch from home. 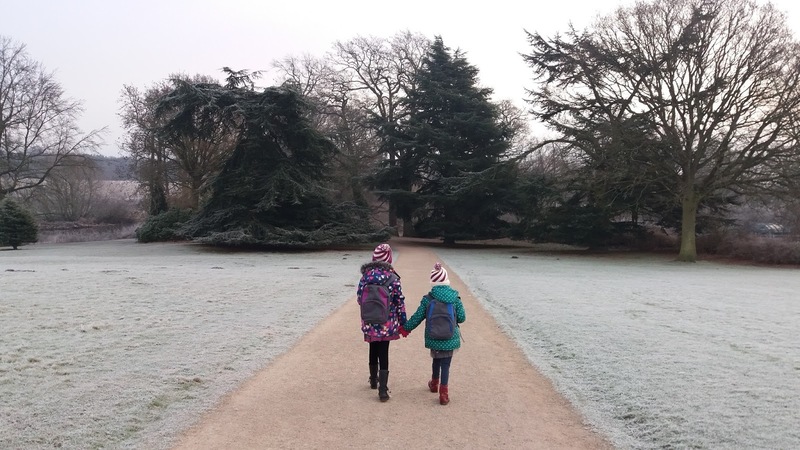 Little M is actually eligible for a free dinner everyday because she is under seven however, they are not fans of school dinners they prefer to take a healthier lunch from home. So I compromise, she takes a lunch bag three times and has two free dinners a week. I don't do Sudoku or crosswords or brain training puzzles. 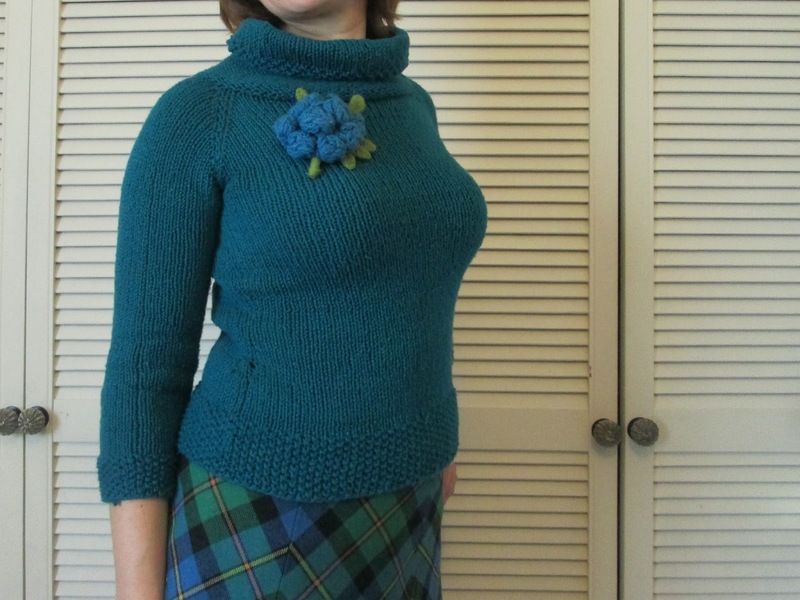 Knitting patterns are my equivalent. 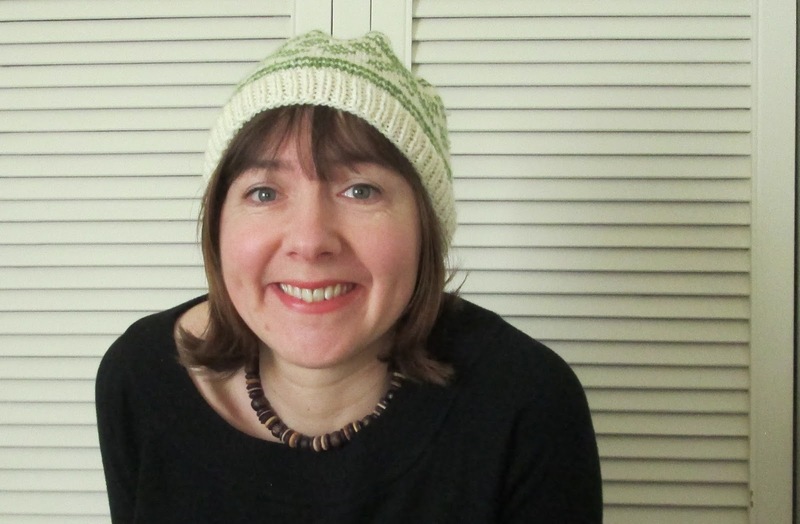 I really enjoyed making this hat recently out of left over stash. 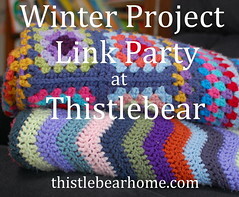 It is a thinking knitters project. The yarn is the last ball of King Cole Merino blend aran left over from my crochet bag and the green Wendy Serenity Chunky is the last bit of yarn left from my oh so wearable green jumper. I had to adapt the pattern to use up the wool I had but that was half the fun too. 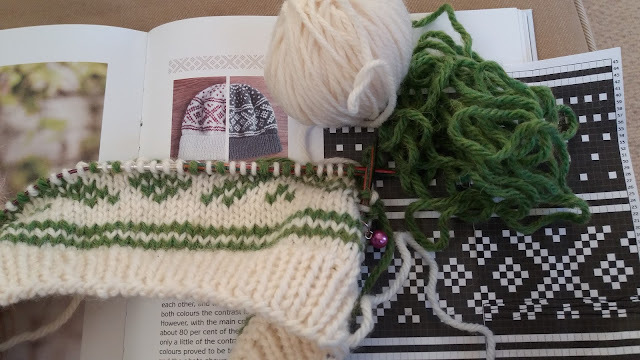 The rib is single not doubled over, I was unable to complete the individual snowflake stitches towards the top but as the pattern was written for DK and I was using chunkier wool, I didn't have room for that bit of pattern anyway so I motored on with the crown decreases. I also had a go with the tassel maker I had for Christmas but in truth, it was no better than wrapping yarn round a piece of card but there you are, it was fun all the same. I will leave you with a few wintery snaps from a walk which have no particular narrative or link other than the theme of 'cold' to go with the woolly hat. Another stash busting gift for the present box. 21 days without buying craft materials, Whoop! 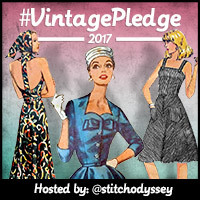 I really enjoyed the vintage pledge challenge 2016 and although it is not running with prizes this year, it has become such a part of what I now sew that I will continue to tag my vintage pattern makes for 2017. I was a finalist in the outerwear category with my 1960's coat in the final prize draw which I was very proud of. Pop over and see the amazing winner here. I normally make a separate post for each item I make but I made these to go with each other as an outfit. The fabric is from Myfabrics.co.uk The dark olive cord is fine and velvety, a January sale purchase from 2015 and the lightweight cotton is from the same company but from their January sale in 2016. You can see why I am stash busting this year can't you? 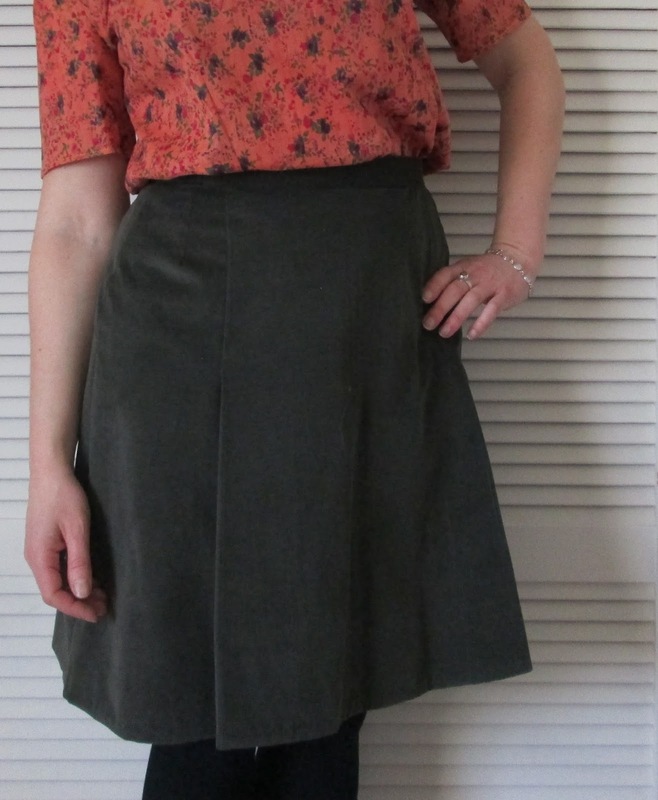 The skirt is a simplicity pattern from 1970; just look at that hat! but I liked the look of the skirt with pleats. It was easy to do and the fine cord pressed well and was not too bulky on the hem. The only modification I made was to shorten it by 3 inches. 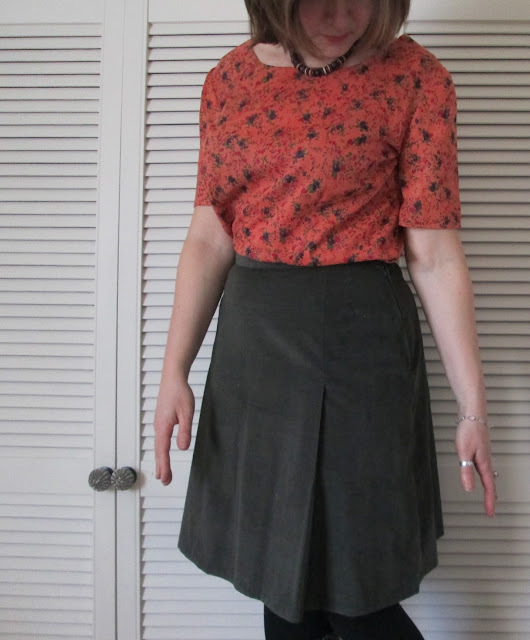 I made the top from my favourite vintage pattern:simplicity 7642 because I know it fits. I made View 4 so I can wear it tucked in or out. 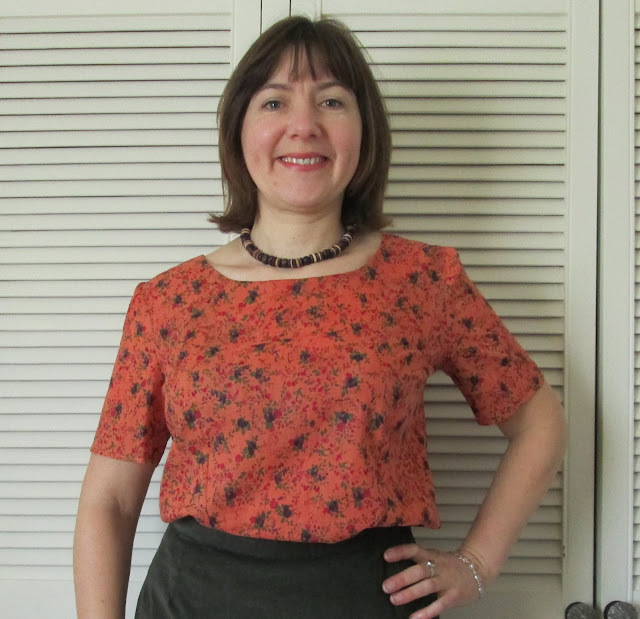 I love this orange and olive combination, which I used for my Cleo dungaree skirt too, it goes with my embroidered boots superbly. I'm still playing Vintage Pledge. 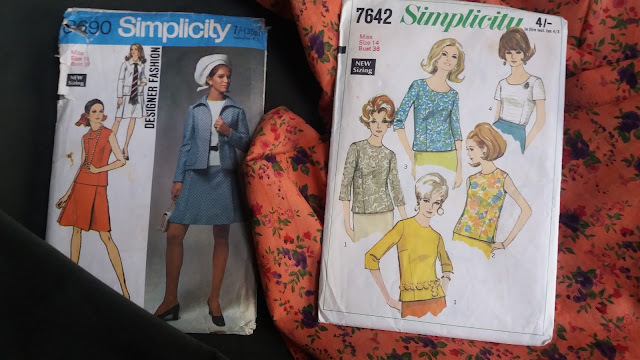 I still love collecting patterns and I still love sewing. 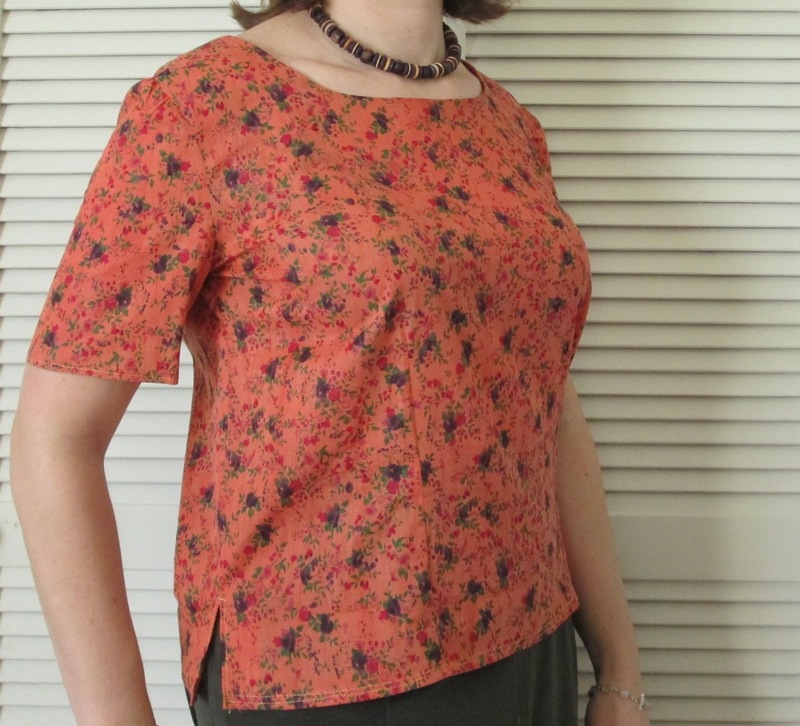 I had some Ponte Roma stretch fabric left over from a tunic dress, it had to go. There was not enough to make a top but I felt sure there was enough to make a stretchy jersey skirt. The fabric is 20% stretch. 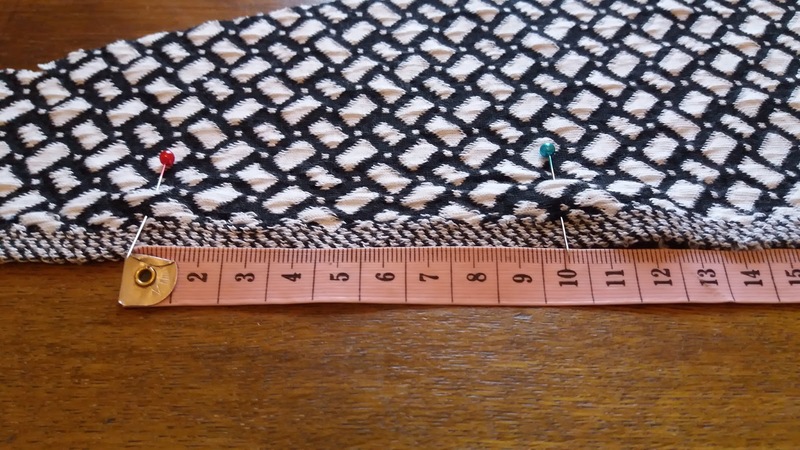 To check, I measured 10cm and then stretched the fabric to its limit. The blue pin reached 12cm so it has 20% stretch. 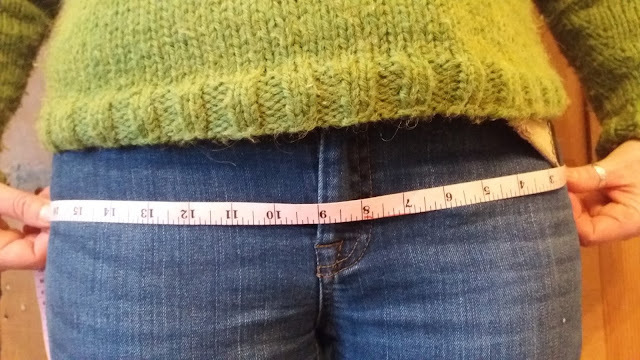 Next I measured my front hip measurement using the side seam of my jeans as a guide. It was 19". I did the same across the back and it was 23". I measured the finished length required then added 1.5" for elastic turnover and 1" for the hem. As you can see, the bespoke nature of this skirt means if you need more at the front for a bigger tum you could do that or in my case I need more fabric round the back! Either way the side seams will be at my sides.This is a super speedy over locker make but you could do it on a regular machine too. Sew the sides, try it on to make any adjustments then serge or zig zag the top and bottom. Join the elastic into a hoop using the 1/2 inch you allowed yourself. 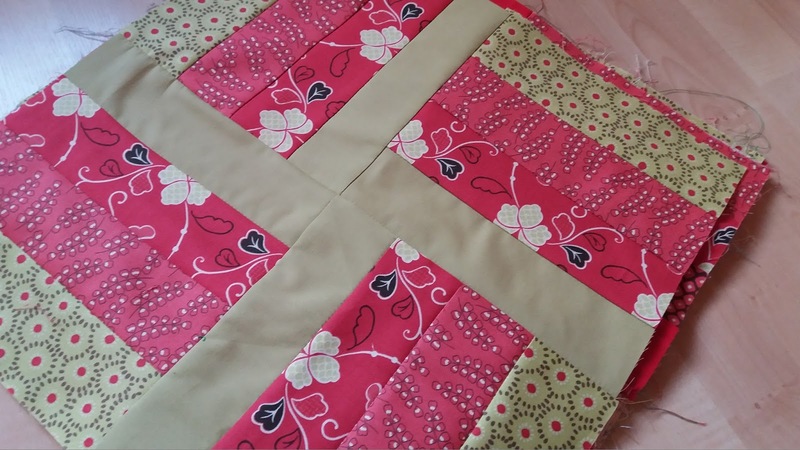 Now zig zag or overlock your elastic in place by stretching the elastic to fit the fabric. Do not stretch the fabric. 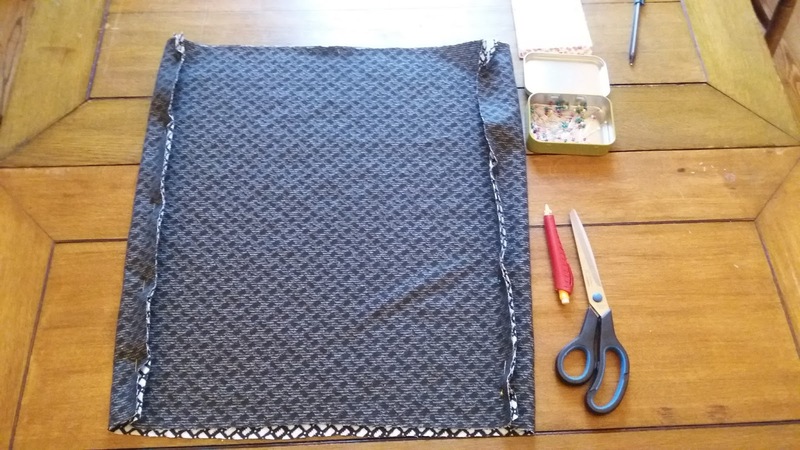 To finish fold over the elastic and use a straight stretch stitch to run a line of stitching through the skirt and elastic fold over. You will need to stretch it a little to allow the waistband to stretch over your hips when you put it on and to avoid puckers. This is thick ponte roma jersey so I turned the overlocked edge once and top stitched it in place to avoid a bulky seam. Hooray! New skirt. 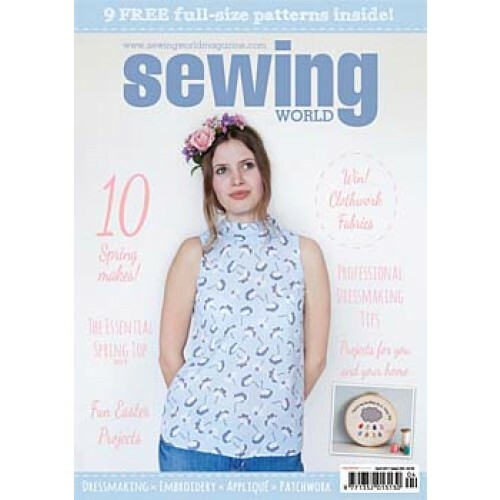 This is a great way to practise with Jersey knit fabrics without wasting too much fabric.If it all goes wrong, put it in the bin and try again - you will get better in no time at all. Mine however was worn to work on Monday to invigilate exams - super comfy for sitting down for 2 hours. PS. I will put a link to this tutorial on my sidebar which I have updated a little with some previous useful blog posts which were lost in the midst of time. Last night I completed a top down sweater. I started it in November 2016. It is made from Cascade Luna 100% peruvian cotton so it is comfortable to wear next to my skin without an under layer. I bought it last year on sale where your whole order was half price so it came in at £19.75. 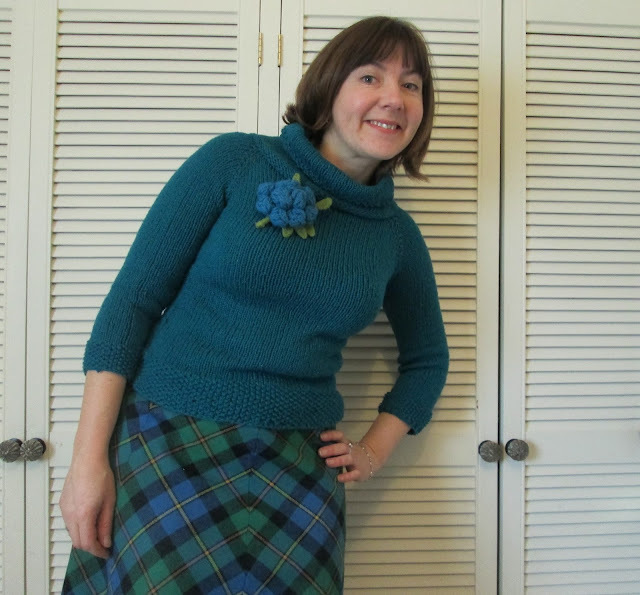 It is really for Spring and Autumn but it happens to go superbly well with my cut off Vintage wool skirt. 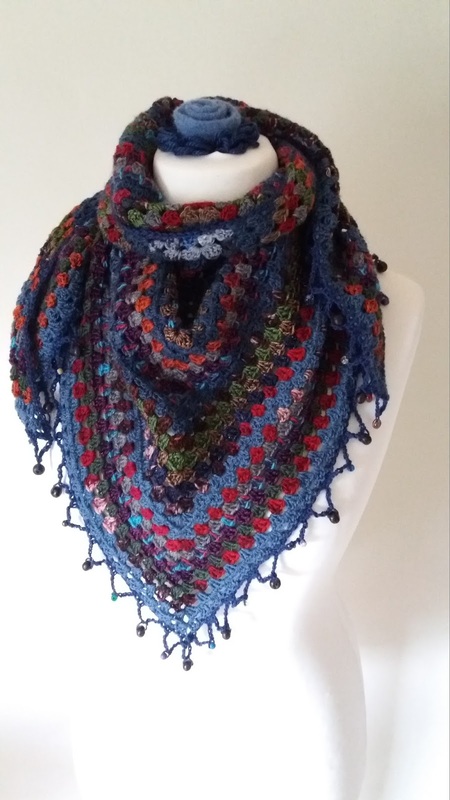 The pattern is free from Ravelry called Francis. It is knit from the top down and then you add the cowl neck at the end. 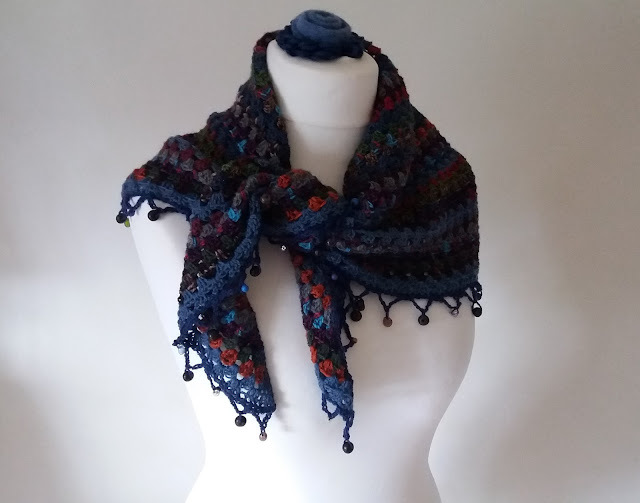 I think the pattern is actually for a thicker yarn as mine is quite close fitting and the neck cowl is nowhere near as big and cosy as the one on the pattern but I loved the hepburn style collar that emerged so I worked with that. You can see on this photo where I did the waist decreases as well as a small ladder that appears along the sleeve because I knit the sleeves on DPN's but with wear and a wash this will ease out. They are tiny details. Overall I really like it, it is comfortable and fits in with lots of things I already have so it is a useful addition to my wardrobe. 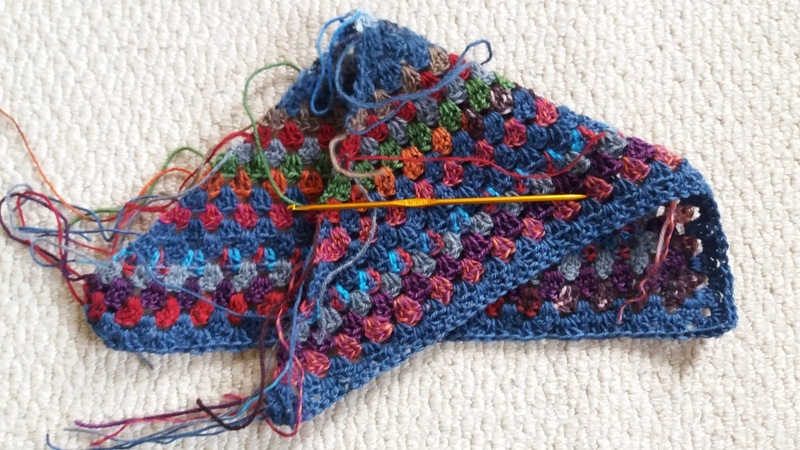 Because it is top down, meaning you are knitting in a spiral,I knit most of it in continental style picking the wool from the left rather than picking up a stitch and knitting it with the yarn on the right. I got a lot quicker as I did it. I can not quite get the purl stitch to flow the same yet but it just goes to show you can teach an old dog new tricks. Not just a little bit, but a lot. I laid them all out on the floor and walked out of the room to sulk downstairs. Andy returned home and asked me what the matter was because my face looked so disconcerted and I asked him to take a look in the spare room with out any back story to influence him. He returned and said, 'You seem to be making a fascist duvet!' which made me smile in its cadence but not in light of the whole situation. Most are fine, so I will have to unpick a few and rearrange the patterns and colours to avoid the final outer colour highlight which gives the unsavoury silhouette. Ho Hum! 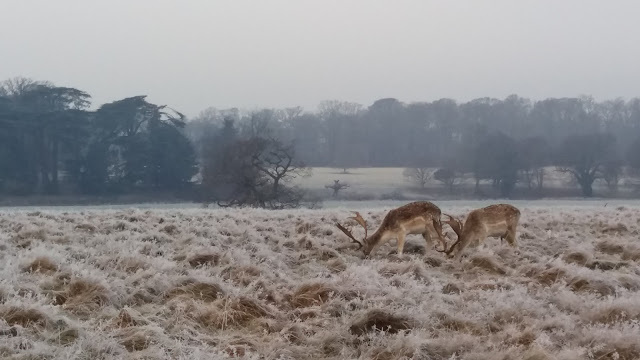 Here's hoping your winter projects are more successful, just popping over to see some now. 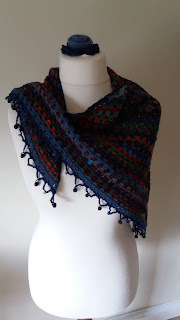 I have slowly made another shawl from sock yarn left overs. The edging is made with a single row of double crochet (sc) all around and then a row of: *miss two dc: 5ch, bead, 5ch, 3dc * repeat. 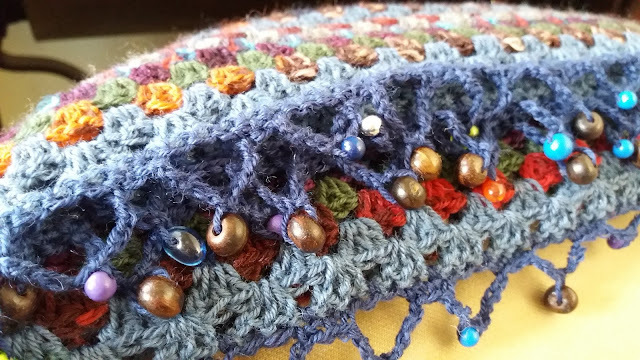 There are 47 rows on the shawl and 58 beads. The beads help it to stay put when you wear it because it weighs the edge down. The colour palette has quite a lot of blue which should go with the recipients coat perfectly. 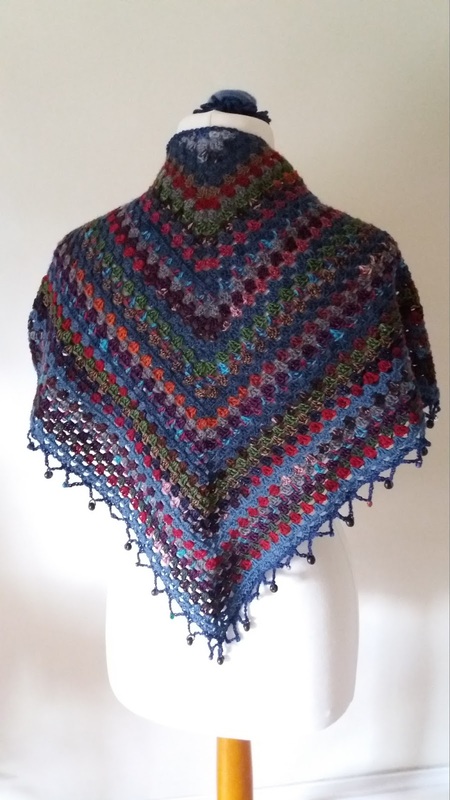 The blocking gave it a perfect triangular shape. 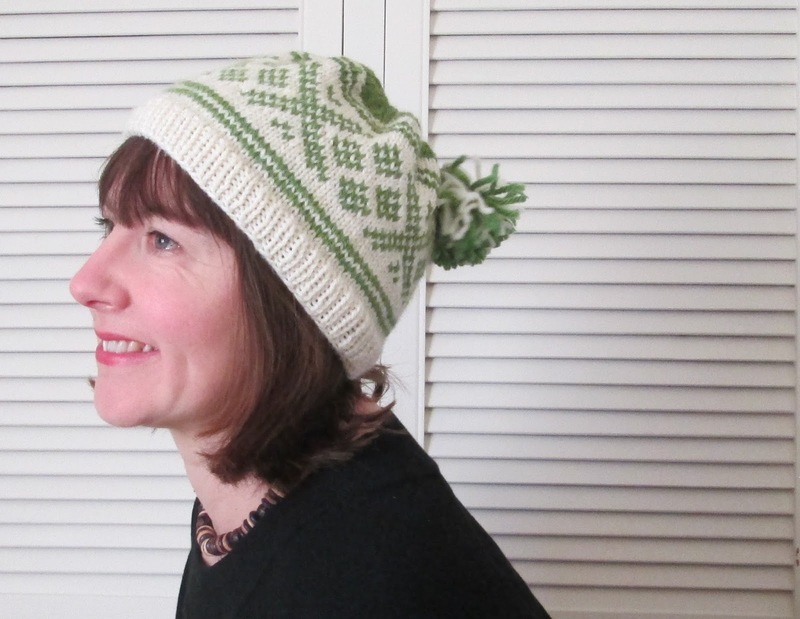 You can find the pattern here if you fancy using up some yarn left overs. You can use any gauge yarn as long as it is the same throughout. This photo, on a brighter day, might give you a better idea of the colour range. This is a very special gift for a very special someone.